We are proud to feature selections of the highest quality and craftsmanship in jewelry, glass, porcelain, stoneware, raku, wood, silks, and hand-wovens from regional and nationally recognized artists. We are the only American Style Preferred Gallery in Southwest Missouri. Our entire selection is very extensive and we hope you will come visit our store to see more than this preview. Linda Brunner is a former elementary teacher from California, who creates paper mache' art. She now resides in Missouri and uses animals as her subjects for her for whimsical works of art. Bill Decker obtained a Bachelors Degree in Art from Eastern Michigan University. For his gourd art, he draws his designs free hand and uses wood burning, dyes, acrylics, pen and ink, carving and cutting to obtain the finished look he desires. Stephanie Witte is a former art and english teacher who resides in Missouri. 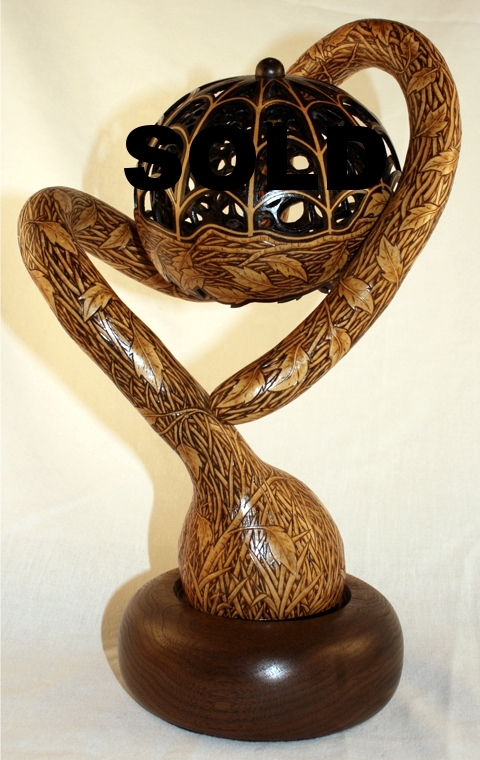 Her mixed media sculptural gourd creations range from tiny pieces not over two inches tall to 6 foot large assemblages.